Canberra is the capital of Australia. The city is located at the northern end of the Australian Capital Territory, 280 km (170 mi) south-west of Sydney, and 660 km (410 mi) north-east of Melbourne. The National Gallery of Australia is the national art museum of Australia as well as the largest art museum in the country, holding more than 166,000 works of art. Established in 1967 by the Australian government as a national public art museum, it holds the nation’s most important and comprehensive collection of Asian art. Sculptures, textiles, paintings, prints and manuscripts, all of exceptional quality, are displayed in three main spaces dedicated to Art of the Indian subcontinent. Chola dynasty ruled our land well and for long. The heartland of the Cholas was the fertile valley of the Kaveri River. Under Rajaraja Chola and his son Rajendra Chola the dynasty became a military, economic and cultural power in South Asia and South-East Asia. The Cholas left a lasting legacy. Their patronage of Tamil literature and their zeal in the building of temples has resulted in some great works of Tamil literature and architecture. The Chola kings were avid builders and envisioned the temples in their kingdoms not only as places of worship but also as centres of economic activity. The Chola period is also remarkable for its sculptures and bronzes. One such temple exist in Sripuranthan too. Away from the complex cities is Sripuranthan, a dusty village in the Ariyalur district of Tamil Nadu. It is around 250 kms away from Chennai. There will be muddy path winding across parched lands, scraggy cattle, suddenly enthused village elders, frolicking children – old Temple – all signs of any village scene of South India. ~ and this village is in global news – with great details being put up in Australian Press – connecting it to the visit of Australian Prime Minister Tony Abbott’s visit to India. 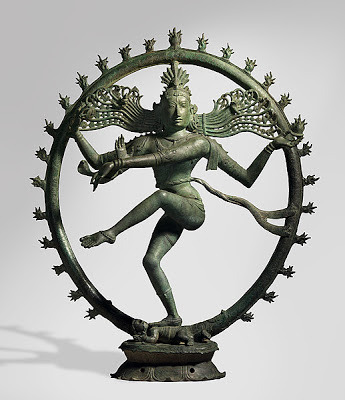 The Lord of Cosmic Dance from this village travelled thousands of kilo meters smuggled from out his pedestal to the National Gallery of Art Canberra, Australia – by unscrupulous idol dealer Subhash Kapoor, reportedly bought by NGA for Rs.31 crore in 2008. Subhash Kapoor is not alone nor or idols from Temple ..... in that maze of network some missing Gods have landed up in foreign lands at private collections and art galleries. Our Nation was rich – still possesses rich heritage. Over the years by systematic exploitation and plundering, Hindu artefacts have been smuggled out of the Country to famous museums in Europe, America and elsewhere. Many prestigious museums display Statues, Hindu religious sculptures and artefacts as owned / acquired by them. To any devout person these are not mere sculptures or statues – they are GOD in themselves… what should have been in a Temple whether famous or not so famous and be the subject of reverence and daily Pujas, had been looted / burgled and smuggled out by unscrupulous thieves and are now attracting Tourists elsewhere. This particular Nataraja idol was described in the gallery as : Chola dynasty (9th-13th centuries)India. Shiva as Lord of the Dance [Nataraja] 11th-12th century; bronze lost-wax casting : 128.5 h x 106.0 w x 40.0 d cm; further described in their website as : *** Shiva as Lord of the Dance is probably the best-known sculptural image in Indian art. The powerful Hindu god Shiva appears encircled by flames, representing the boundaries of the cosmos, as he performs his dance of destruction and creation. The Indian Govt had been trying to get this stolen idol back and NGA had been denying any wrongdoing and had even stated that they had not been approached by Indian Police / authorities. 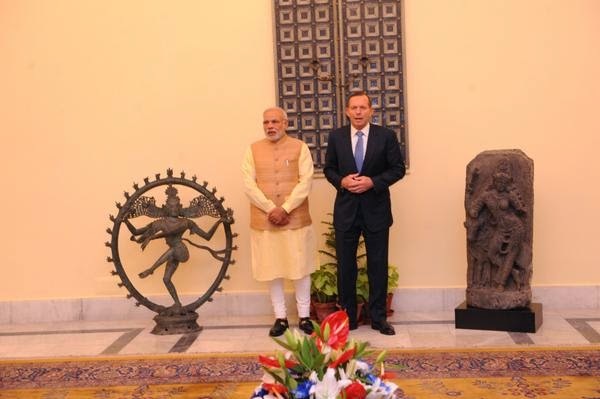 The good news now is that the $5.6-million bronze Nataraja idol of the Sripuranthan temple and a $300,000 stone Shiva idol will be handed over to Prime Minister Narendra Modi by his Australian counterpart, Tony Abbott, today. An official is quoted as stating that the Australian leader wanted to bring the two idols on his plane, but both were so heavy that a jumbo aircraft had been requisitioned. Tony Abbott will hand back the 900-year-old bronze “dancing shiva” as also a $300,000 stone Shiva with Nandi will also be returned. We feel happy and thank the Australian Govt for this gesture. Sadly, in some places over the years when the villages lost their economic sheen, people moved out or villages were destroyed by nature and other means, there by the temples became somewhat neglected. Ruthless criminals have exploited these and have stolen the antique idols and have shipped them abroad illegally making huge money……… all those involved, those who stole, those who abetted, those who assisted in moving them and those who bought fully aware that they were not acquired legally – all needs to be punished.